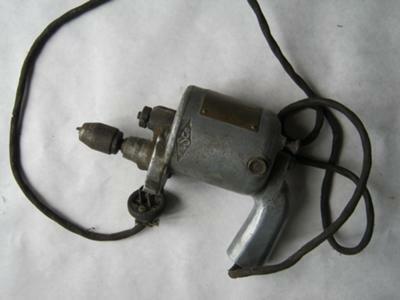 This is an old hand drill that was in a very old handmade wooden tool box given to me about thirty or more years ago. Was made by Knight Engineering & Sales Co., of 30 West Walton Place, Chicago, & 210 W. Seventh Ave., Los Angeles, according to an ad in Popular Mechanics from 1922. It says, "Weight 3 lbs., Capacity 1/4 in., Westinghouse Universal Motor Guaranteed." If you're interested in selling it, let me know (I'll click the "Notify Me" box for this thread). Nice find!